"Britain’s crown dependencies have been plunged into uncertainty after the government signalled, in a dramatic sign of the intensifying pressure on tax havens, that their corporate tax regimes were unacceptable to the European Union. The news is set to force Jersey, Guernsey and the Isle of Man to overhaul their tax regimes, possibly requiring them to introduce corporation tax. 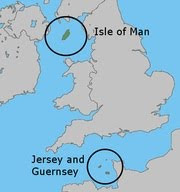 In a further setback for the Isle of Man’s finances, it was told that the “common purse” agreement under which it shares value added tax with Britain was under review." This is important news. Read more here.